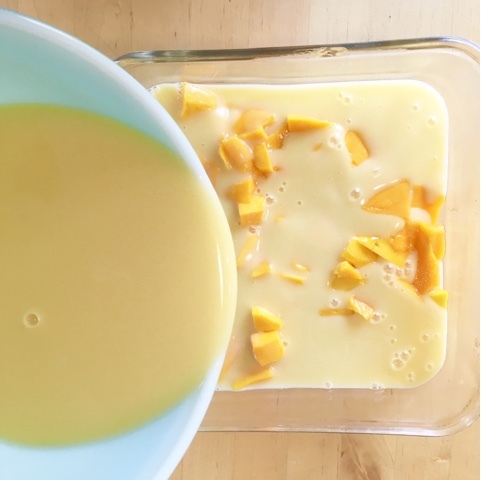 My kids love their aunt's mango pudding. Rich, creamy and spiked with fresh mango, they would probably sell their mother for a pan of it. I asked her for the recipe and have been sitting on it for years, desperately trying to replicate that flavour. Hers requires cans of mango purée which can be hard to source where I live. However, I have been working on recreating it and I think I have finally 'cracked the code'. 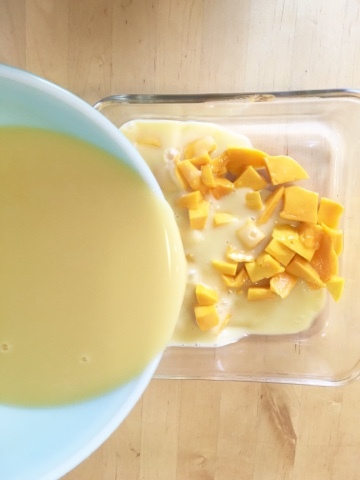 Here is my version of her mango pudding but made with (the much easier to source) mango juice. It is such an easy, no-cook, summer dessert. And my kids have never been happier. This can be easily customized to have no additional sugar to adding just to taste. I generally use bulk organic gelatine, but either works great. Alternate thickeners like agar agar can be used, but the quantities will need to be adjusted. The mango juice can be anything in a tetra pack carton (any will work) but, for best results, preferably one that has some thickness to it like a nectar with puree listed in top two ingredients. If it contains added sugar, you may not need as much (or any) sugar in the recipe. 1. Place gelatin and the 1/2 cup of room temperature juice in a large bowl. Whisk together for a minute or so. Let stand or 'bloom' for 3-5 minutes. For more info on blooming and gelatine, click here. 2. 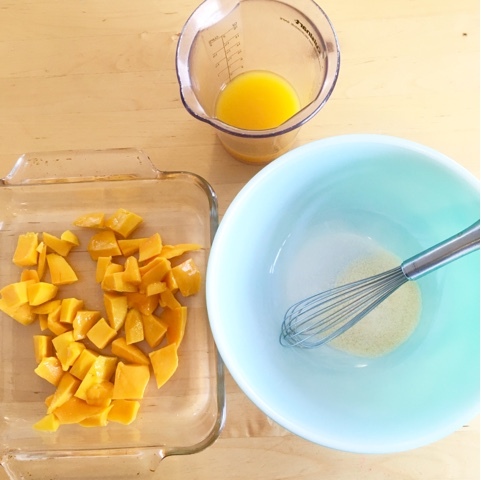 Put mango chunks into the serving dish (any container that will hold about 4 cups of liquid---a pie plate, a 8" X 8" pan, anything). 3. 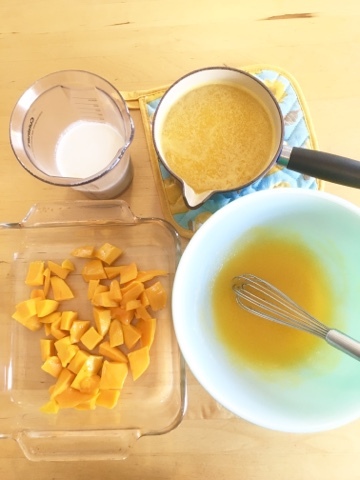 Add the 2 cups microwaved or stove-heated mango juice (not boiling, but hot) to the bloomed gelatin. Note: Organic gelatin typically specifies not using boiling liquid, but just hot liquid. However this does not seem to be an issue for conventional gelatin. Whisk until smooth. If it could use a bit of sweetener, add 1/4 cup sugar to start and whisk until dissolved. Whisk in cream and milk. 4. 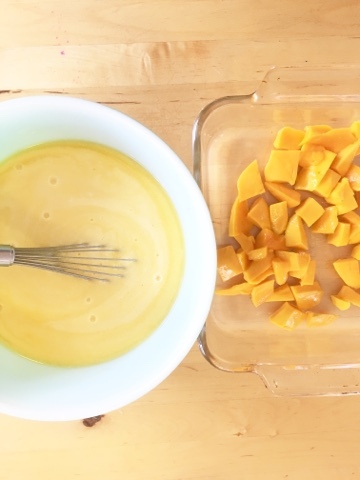 Pour mixture over the mango pieces and place into the fridge for 3-4 hours or overnight. Can be served with additional cream poured over if desired.